Mmmm. That does sound like some fine comfort food! Of course, I’d have to take the suggestion of adding chicken or another meat to make the carnivore, aka my husband, happy. It is a big bowl of comfort…with or without the addition of some meaty goodness for the carnivore. Jenna, I think this recipe has your name all over it. Hope the two of you will become good friends. I can’t even begin to describe how good the combination of mushrooms and creamy sauce is with the pasta. 9:06 pm and no dinner yet. This is torture. Torture which I must make even if not tonight. Love Mark and Bruce…go goat! Sorry to torture you with mushrooms and cream sauce Barbara ; )� This is one of those simple, satisfying dishes that’s great to have in your lineup.� Hope you’ll try it out soon. This dish has my name all over it. 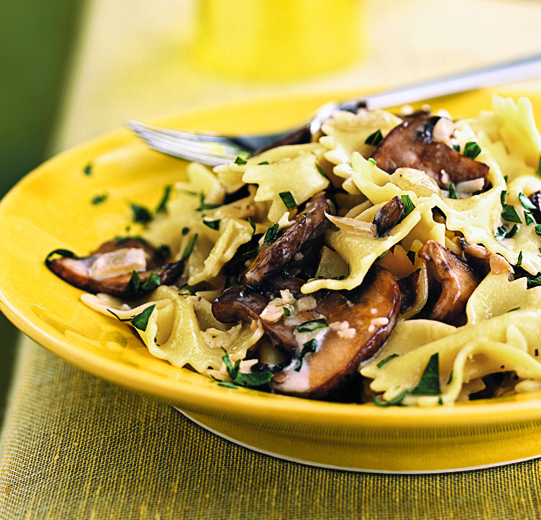 If I wasn’t out of mushrooms, I’d be making it tonight (with your modifications!). Thanks for sharing the recipe! Tracy, I hope you get to the market soon so that you can sink into this.� If you like pasta with mushrooms and creamy sauce, then you’re sure to be charmed by this dish.